He was a tall man with graying hair, penetrating eyes and a countenance that brooked no misbehavior from anyone in his presence. In his earlier portraits, he appeared taciturn and a little arrogant but as time moved on and the black and white portraits gave way to color, the traces of a smile would be captured on film and as he grew older still, a hearty grin if it suited him. He took himself seriously, almost too seriously sometimes and this was evident in how he carried himself in public settings, always being the minister, the preacher, the pastor, the Reverend. A large hand placed on a shoulder could convey comfort to those that needed it, just as his deeply resonate voice could invoke the Spirit to come and fill those in attendance when he prayed. A Sunday blessing was a two minute affair, made all the longer by the enticing aroma of freshly baked bread and roasting meat. He commanded attention and respect from all those around him, even the small child who stood close by his side, mirroring his posture and his ramrod-straight bearing, hands clasped behind his back and looking dutifully at the floor while the prayer went on and on. This was the public persona of The Reverend, cultivated over many years of carefully looking after his various flocks. Born in the hilly countryside of northern Georgia, in the shadows of the mountains to a poor but industrious farmer and his hardworking wife, his thirst for knowledge and books was only kept in check by the hard life of farming that he had to endure his first 17 years of life. As the oldest of five children, he not only had his own workload to carry but also the responsibility of helping to look after his younger sisters and a brother. This did not deter him from his quest for an education and he would become the first in his family to graduate from high school in 1927. Through the jobs he could get, often hard and laborious, he put himself through college, another first in his family and even though the Depression was at its peak, he secured a job as a teacher and later, a principal at the small county school he worked for. He courted a young woman for some time and fell in love with her but circumstances changed and she married another man while he remained a bachelor and went back to school for a Master’s degree. When the second great world war erupted in the 1940’s he thought himself too old to serve but the local draft board had other ideas and in his 30’s he found himself fighting with the Allies against Rommel in Africa. Serving first as a soldier and later as corpsman, he transported the wounded through heavy fire to safety and rose to the rank of Sergeant. When the war was over, he returned home, a changed man who had found a closer relationship to his God, feeling that He had watched over him and protected him from harm when men right next to him died before his eyes. The woman whom he had always loved had divorced her husband, something unheard of in those days and they soon were married. With this marriage, he gained a wife and a stepdaughter, followed by a son of his own barely a year later. He went back into education but he felt a calling that he described as too powerful to overcome and he made the decision to answer that call. He enrolled in college again and gained another degree in theology and was ordained by The Methodist Church in 1954; thereafter, he would give up his home and he and his family would go where the Church decreed. As a father, he was often stern and sometimes unbending and he expected his son to behave as the child of a minister should, but when he became a grandfather in the 1960’s, he could not have been more proud and nothing made him happier than to have his young, inquisitive grandson accompany him on his ministerial rounds. They visited his parishioners in their homes, in the hospitals, in the nursing homes and at the funeral home and his grandson followed him closely and asked him questions about everything, and he, being the Reverend, enjoyed talking. Though highly educated, he had an ability to talk on whatever level his listener best required, with a simple man’s mannerism and a straightforwardness that enabled him relate to anyone, no matter their station in life, no matter their age. A prolific storyteller, he spun the memories and experiences of his life into his sermons, was both engaging and entertaining and despite his stoic appearance, he possessed a sharp wit and an engaging sense of humor that could produce great laughs from his listeners when he let this part of his personality shine through. But the best of himself, the part that made him such an interesting person, he reserved for those he cared the most about; his family and a few of his closest friends. He was not given to many vices, because as a minister he had to live above such things as best he could, but he loved to eat and he loved cigars and he always liked to have a nice car…not a luxurious or expensive one… but a nice one to drive. He was not overly large because he enjoyed walking everyday and his 6’1 inch height helped him to hide the evidence of his love for extra biscuits and jelly. If he battled anything, gaining weight was his personal adversary and he fought that battle most of his later years, by walking and doing things around the house that needed doing. He never wore casual clothes and until he retired in 1974, he always wore a suit every day; after that, he would just forego the tie and coat. When he became a grandfather, he noticeably began to mellow and his visits to his son became more frequent than usual and with an ulterior motive that often resulted in the grandson accompanying him back home for a few days to visit. With his wife teaching school or home resting, he would take his grandson out in the big, shiny Ford LTD for ice cream, to the 5 & 10 cent store for a toy or for a visit to a church member. He would take him around town to see the landmarks his grandson enjoyed, like the big Dixie cup or the miniature village in Augusta or the mill town houses in Clarkdale when they were decorated for Christmas, to the city park in Powder Springs where he would sit on a bench and watch his grandson play on the swings and to the Big Red Apple in Cornelia. The grandson didn’t know that his grandmother’s health was failing and that his grandfather was worried; he just played with reckless abandon and when he sensed his grandfather was sad, he would tell him silly jokes to make him smile again. 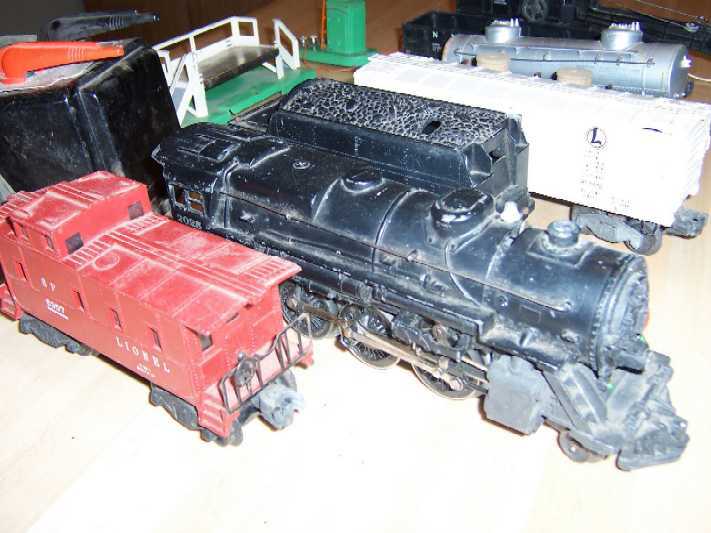 One day the Reverend came home with a large box with bright lettering printed on it and from that box he produced a toy electric train, with a black locomotive and coal car, a blue freight car and a bright red caboose. Several feet of metal track was laid and as the electrical transformer was engaged with a slight hum of electrical power, the locomotive would chug its way around the track, pulling its load for the delight of his grandson. The train travelled everywhere, delivering its freight of Matchbox cars to destinations near and far. It would travel into the dark tunnel under the bed and emerge from the other side, puffing smoke and making sparks fly from its wheels as the hot current powered its motion. Sometimes the train went too fast and horrible accidents would occur, strewing tiny cars and smashing paper trees; at other times, the train would be attacked by a giant, menacing Snoopy, who delighted in knocking the train from the track but always helped to put it back. The grandfather enjoyed watching and would laugh at the frequent accidents that always seemed to occur and he often took the controls himself, enjoying a delight that poverty had denied him when he was a child. His eyes would twinkle and a smile would light up his face as he played, sitting on the floor and laughing with his grandson when the train went too fast and would fall over. They would often miss the first few calls to the dinner table, so engaged were they in the travels of the mighty train that no matter what adversity it encountered, would always manage to find its way to the rail yard and back into its box. No matter how many times it was knocked over, it would always be put right again. These were the moments when he was the happiest he had been. When his wife slipped away a few years later though, he entered the darkest period of his life and through a recorded testimony, he revealed his despair and his hopelessness that life would ever afford him much joy again. During that summer, his grandson would visit him for weeks at a time, and they talked about life and they walked through town and visited the cemetery at sundown on many a day. He prayed to God and never lost his faith in God, through his daily prayers to ease his pain and help him find peace. As that long year gave way to another, he found someone to love again and a very old friendship that had gone separate ways many decades before blossomed and eventually a new union was celebrated. As a new wife came into his life, a new grandmother was gained and the grandson grew to love and accept her as his own and life went on this way for many years. Entering the last two decades of his life, the Reverend and his new wife travelled together and saw many things and gained many new experiences as they shared their lives together. Her family and his gained new traditions together and Thanksgiving became a time of fellowship for all of them to unite and enjoy a time of thanks and of family. The grandson still came and visited, driving his own car now and they looked forward to their time together and long conversations that lasted late into the night. He still travelled to see his grandson as well and was there when he graduated from high school and at Christmas celebrations when he could get there, even though he probably didn’t need to be driving long distances anymore. One day, in the waning years of his life, his grandson came to visit him for a few days, now a grown man himself. His grandfather asked him to get something for him out of a closet and while he was searching for it, he discovered a battered box, its colorful words faded and its corners held together with tape. In that box, asleep for a decade and a half, lay the old train, battered, worn and tired, its track bent in places. While the grandfather watched, his grandson took each piece of track from the box, straightened it carefully, put it together and carefully connected each car to the old locomotive. The transformer was cleaned of dust and plugged into the wall where it began to make a low but very noisy buzz as life poured into it again. Slowly, very slowly, the old train began to chug sadly around the track, struggling with each turn of its wheel, each forward thrust of its piston rod and it was feared it couldn’t make it. As the two of them watched, the old train began to pick up speed until it found its pace, not nearly as fast as it once could go but fast enough to do its job one more time. They watched and laughed and talked about all the places the train had been, the things it had seen and the shiny little cars it once delivered. After a time, the train was put away and the grandson watched his grandfather slowly walk away to his room for the night, struggling with each step until he found his pace, not nearly as fast as he once had gone but making his way one step at a time. This was the last time the grandson would ever see him in his own home and a few years later, he made his final journey to reunite with those who had gone on before him. The old train never worked again but it lived on in memory as a reminder of journeys once travelled, of places seen, of laughter and of sadness, of experiences that shaped one person and instructed another, of the bond between a grandfather who taught so much to a grandson so willing to learn all that he could from him. Such was one journey shared by two people over three decades and the spirit of that journey lives on, echoing faintly like the faraway whistle of the train, forever distant, yet close and comforting. This is so sweet! I shed a few tears at the end, feeling I had come to know your grandfather a little and sliding back up to take a longer look at the old train. Thank you again.